Ever wonder how your emails are doing compared to others? Email campaign KPIs, like average open rates, click-through rates and click-to-open rates, can be difficult to benchmark. That’s because across sectors, different types of businesses often have different use cases and audiences for emails. Some kinds of emails naturally drive more opens and clicks. For example, ecommerce retailers may send lots of “Here’s your purchase receipt” and “Your order has shipped” emails to recent shoppers (who’ll probably open them to check the status). Media sites likely send more “daily newsletter” emails to their magazine subscribers (who may or may not care about the stories included). That said, there are a few things that will make a positive difference in your email performance metrics regardless of your industry. In this post, we’ll share the current state of average marketing email open rates, click-through rates, and some tips on how to send better ones. According to the DMA’s Email benchmarking report 2018, email open rates across industries are strong, at 18.1% on average, despite a slight decline compared to last year. Click-through rates remain 1.9% YoY. B2C emails are much more likely to be opened, and have a 19.7% open rate compared to 15.1% for B2B. However, B2B emails win on engagement, with a click-through rate of 3.2% compared to 2.1% for B2C emails. The most-opened emails come from finance (25%), not-for-profits (21.8%), and retail (19.3%). Utility companies send the least opened emails (14.7%). However, utilities lead when it comes to click-through rates (3.4%), followed by not-for-profits (2.7%), and travel (2.4%). The differences between industry marketing emails make sense: Emails from banking institutions often have more relevant, time-sensitive content — information that could impact a person’s investments, for example. Once opened, recipients may easily get the update they came for (no need to click). Recipients that actually open an email from say, their natural gas provider, may be more likely to click-through to their accounts to pay a bill, for example. “These numbers reveal that clicks are still driven by relevance, but opens are driven by interest.” – Skip Fidura, Strategy and Insight Director, dotmailer. 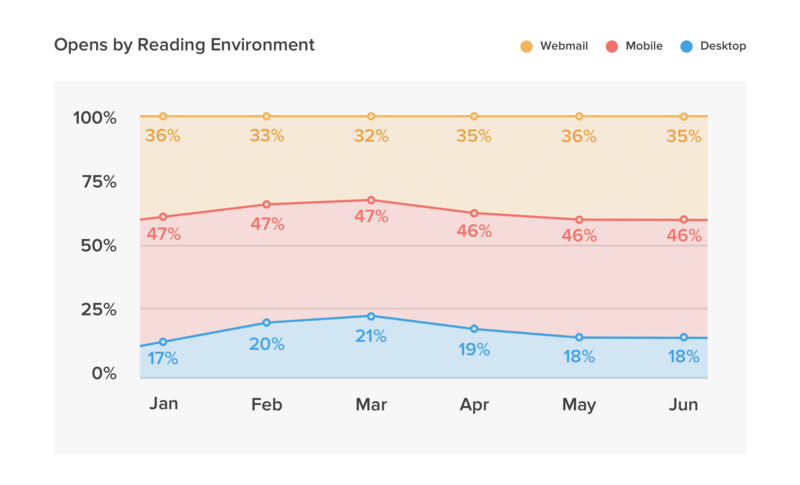 Across the board, transactional emails (like an onboarding sequence) tend to have higher open and click rates versus informational emails (like periodic newsletters). Transactional emails, often triggered by an action a subscriber has taken and thus automatically deployed, will naturally be more relevant to the recipient. As the findings from our Global Commerce Review shows, today’s mobile-first world means it’s more important than ever to ensure your emails render properly on mobile devices. 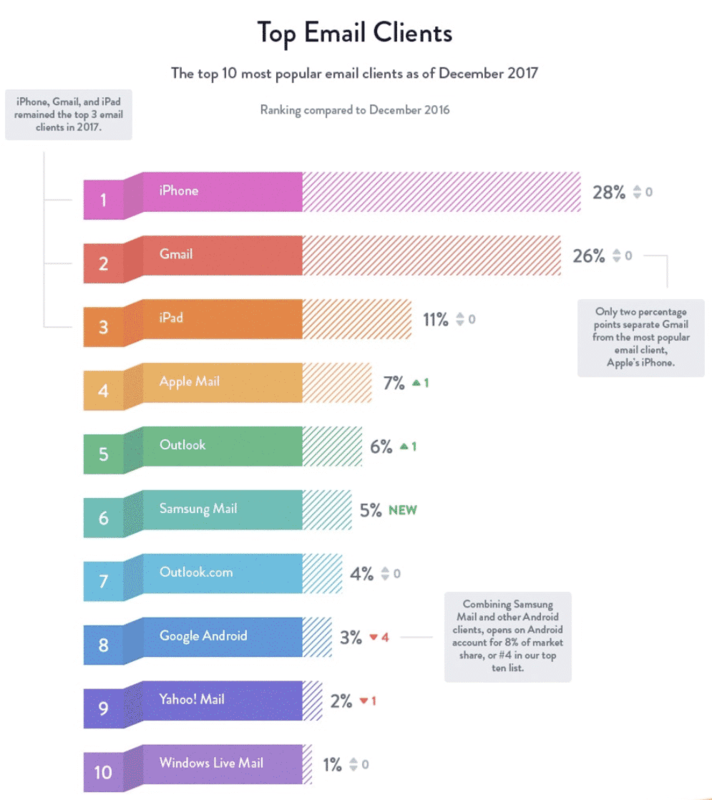 According to Litmus’ 2017 Email Client Market Share infographic, which analyzed 15 billion email opens, mobile is still the most popular reading environment for email. The study showed that most emails are read on iPhones (29%) and in Gmail (27%). That’s a combined market share of 56%, meaning the majority of emails are read in one of these clients. In June 2018, mobile made up nearly half of all email opens (46%), followed by webmail (35%), and desktop (18%). 1. A great subject line. Subject lines should be short and give recipients a clear idea what to expect when they open. If possible, A/B test two subject lines that differ in one aspect, like tone or length. Maybe your audience will like “Because your mom’s the bomb” versus a more heartfelt “Make mom feel special this Mother’s Day”. But you won’t know until you try it out. Take a look at your email using a tool like Litmus or Email on Acid. You’ll be able to see how your content appears across a number of devices and optimize for the most common email clients. Make sure that all your images load properly on every device. Depending on the email client, images may be super slow to render or may not load at all. When image files are too large, they can cause some email clients to (kind of) explode. Ensure your content is interesting to and appropriate for the audience segment. As you organize your email subscribers based on different factors (e.g. recent purchases or demographic data), ensure your offers and messages will make sense to recipients depending on where they are in the funnel. One of the most important parts of producing an email is to test all the links. (Every. Single. One.) That also includes images, like thumbnails or headers, that link out. There’s nothing worse than getting an email with broken links — and a quick way to increase one metric you don’t want to go up, unsubscribes. Email has a median ROI of 122% – over 4x higher than other marketing formats including social media, direct mail, and paid search. So before you scurry to throw together your next marketing email and blast your entire subscriber base, take some time to craft a thoughtful subject line, and fill the body with copy, images, and links that are all relevant and work on every device.